We all dread the flu season, but when is the best time for you to get the influenza vaccination and why? 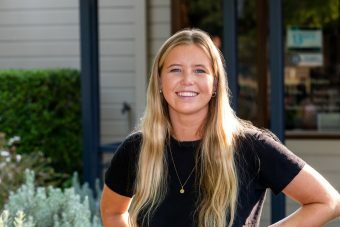 The Sydney North Health Network has interviewed the head of a hospital emergency department, a local GP and pharmacist, and a young patient to uncover the facts about the flu vaccination and the best time to get it. We already know that annual vaccination before the onset of each influenza season is strongly recommended and the typical period influenza circulation in New South Wales is in June to September. “I get my flu shot every year in April or May to prevent getting all of the symptoms and missing out on work if I get sick. I think it’s a good thing to do to completely shut it down before you have any potential of actually getting the flu. 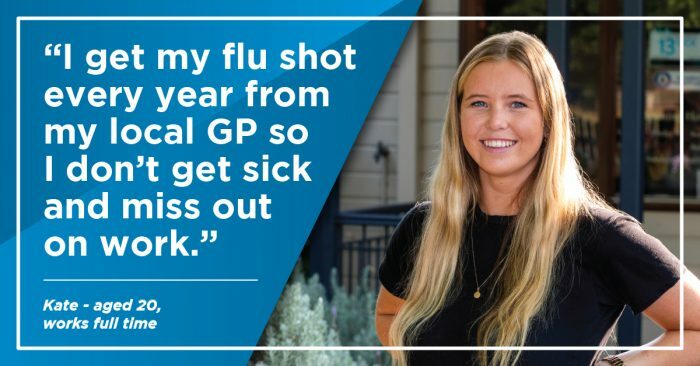 I get my flu shot every year from my local GP,” says our patient Kate who is 20 years of age and works full time. “The best time to have the flu vaccination has changed recently. 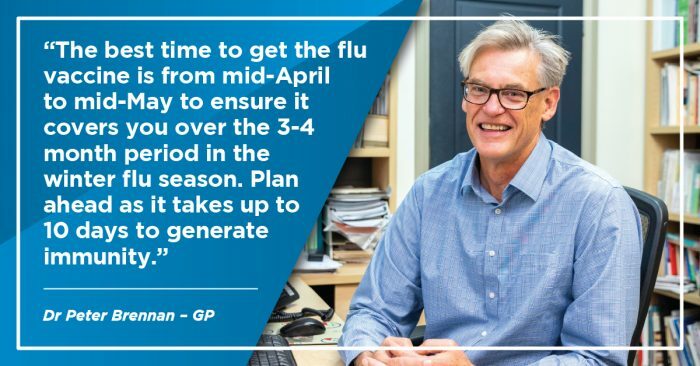 People are used to having the flu vaccine in early Autumn, but we think that the maximum benefit only lasts 3 to 4 months, so we are now recommending that people delay to around late-April to mid-May to get their flu vaccinations each year,” says General Practitioner Dr Peter Brennan. 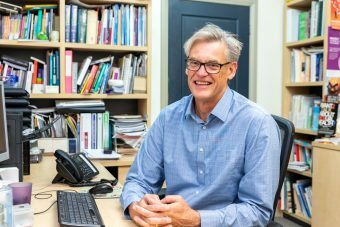 “In 2017 we had a really bad flu year in New South Wales. There were in fact 653 deaths in 2017 caused by influenza across the state. We had a much better year in 2018 with 39 deaths across the state and we believe this was due to improved public awareness about the benefits of the flu vaccine. 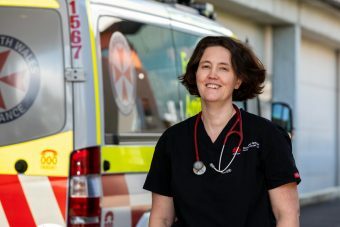 But in both years we had enormous rates of presentation with influenza like symptoms to our emergency departments,” says Dr Clare Skinner – Director of Emergency Medicine at Hornsby & Ku-ring-gai Hospital. Influenza vaccinations can take approximately 7-10 days to generate some immunity. It’s not an instant protection, so it does require a bit of pre-planning. “It is good practice to pre-plan your flu vac because of the delay between vaccination and immunity. It can be potentially too late to vaccinate if you have started to develop symptoms of the flu. Then the vaccine is not going to protect you. However, at any stage otherwise people should be thinking about influenza protection because it is such a widespread condition that does cause a lot of illness and complications,” says Dr Brennan. “I have had the flu before and experienced fevers, high temperatures, chills, a lot of coughing and dizziness. It also lasted for almost two weeks. Not fun at all! When you get the flu you are physically unable to just go about your day-to-day life, your work or study. It’s totally stressful and, in turn, can affect your mental health. It’s awful. As a 20-year-old getting the flu can impact my daily life by putting me behind with work. For my friends if they get sick with the flu they miss study. Losing time on these things is extremely stressful,” says our patient Kate. Did you know that you can also receive your flu vaccination as a lot of pharmacies as well? In 2015 South Australia and Western Australia started doing flu vaccinations in pharmacies for their patients and in 2016 the other states began to follow including New South Wales. “I believe it was introduced so that patients could get better access to flu vaccines. 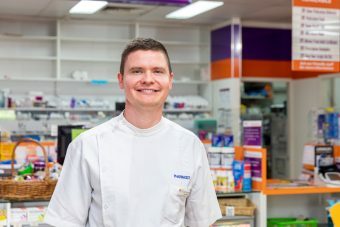 Pharmacies are open longer hours, are readily accessible for most people, and it is quite affordable for people to be able to access the flu vaccines and protect themselves and, their potentially more vulnerable, family members against the dreaded flu,” says local pharmacist Scott Walters. “Not every pharmacist can provide a flu vaccination. Pharmacists need to go through an accredited course before they can administer a flu shot. This course is to ensure vaccines are stored appropriately, administered effectively, and patients are monitored closely straight after the vaccination to make sure there are no side effects. You will know that your pharmacist is accredited to give you the flu vaccination by a certificate that you will see displayed in the consultation room where you receive your vaccination,” informs Scott. The benefits of the influenza vaccine are in two parts – the general benefit to the community and the specific benefit to the individual. From a community point of view, certain members are much more susceptible to severe disease and if we can control the amount of disease in the general population we can protect those vulnerable individuals. In that way everyone being vaccinated helps to protect the more vulnerable members of our community. “For the individual protection against influenza has a lot of benefits in the sense that it reduces your chances of illness during winter, missing out on work or study, and (in rare circumstances) if you become extremely ill with influenza it can lead to hospitalisation or be potentially life threatening. The groups in the community who are at greatest risk from influenza are the aged population (people 65 and over), children under 5 years of age, Aboriginal and Torres Strait Islander people over 15 years of age, and people who have significant other medical complications such as chronic lung disease, heart disease, diabetes, kidney failure or other conditions that render them vulnerable – they are much more susceptible to complications with the flu if they catch it,” shares Dr Brennan. “Influenza can be a very serious illness. The flu is very different to common cold. It comes with a fever, aches and pains and it can come with complications such as pneumonia, respiratory distress and confusion. We’ve had long-term disabilities and deaths from influenza – especially in high-risk groups such people requiring intensive care. People can also end up on long term ventilation from influenza and that is extremely serious. But we have a great tool to prevent it happening with the flu vaccine,” continues Dr Skinner. There are a number of groups in our community for whom the flu vaccination is provided free by the Commonwealth and State Government. All people aged 65 and over are entitled to a free influenza vaccine, as are children 5 years and under, people who have an underlying chronic disease at any age, pregnant women, and Aboriginal and Torres Strait Islander patients. The flu vaccine is also completely safe to be given to women during pregnancy. “There are people in the community who don’t get the flu vaccination. Some people just feel they are healthy and therefore at low risk. There is a common perception that people can get influenza after getting the vaccine, which is really not possible. The flu vaccine is a dead virus that cannot generate an illness. I often say to a patient who says they got influenza form the flu vaccine; they probably got it from the person they were sitting next to in the waiting room. They definitely didn’t catch it from the flu vax. However, it is true to say that when injecting something into a person it can generate an immune reaction that can make people feel a bit achy or sore, but those side effects are usually pretty minor and will generally settle down with no treatment or paracetamol alone,” says Dr Brennan. “You don’t always need to come to the emergency department if you have flu symptoms. You can see your GP or call the Health Direct line on 1800 022 222. The EDs get very busy in winter and you will find that people are crowded and close together in the space and the last thing you want is for people to be infecting each other in the emergency department environment. Of course, if you are really worried – for example if you are having chest pains or difficulty breathing or are confused – you should come to emergency and we’re here to help if you need us,” concludes Dr Skinner. Finally, when the flu season hits, it is really important to good flu hygiene habits. That means washing your hands regularly; if you need to cough or sneeze cover your mouth; and if you are sick you should also stay at home. Please don’t go into school, university or work. Be kind and keep your influenza to yourself, and seek appropriate treatment from your local GP or pharmacist. It is never too late to vaccinate since influenza can circulate all year round. Vaccination should continue to be offered as long as influenza viruses are circulating and a valid vaccine (before expiration date) is available. “The typical illnesses associated with the typical flu will be fever, aches and pains and really feel terrible within their body. They will need bed rest to recover. The flu can also feature dry cough and upper respiratory symptoms such as runny nose, weeping eyes and sinus congestion. Lots of people can develop complications during influenza illness like lower respiratory tract problems such as pneumonia or upper respiratory issues such as sinusitis or ear infections in children are quite common. In some cases people might require further treatment or antibiotic treatment for those complications. Pregnant women should be vaccinated at the earliest opportunity during pregnancy. The 2019 influenza vaccine can be given to pregnant women if the 2018 vaccine was given earlier in the pregnancy. People travelling to a country where flu is circulating can be vaccinated two weeks before travelling if they haven’t already received the 2019 vaccine and the vaccination has been refrigerated. Young children aged 6 months to nine years and under require two doses in their first year of vaccination (given at least four weeks apart), so ideally vaccinate children as soon as flu vaccination stock becomes available. Should a child not receive two doses in their first year, they only require one dose the following year.